Aventa is proud to be the recipient once again of the Roxboro Shoppers Drug Mart Love You Campaign from October 6 – Novmeber 2, 2018. Locally-based, the annual campaign gives Shoppers Drug Mart customers and employees the opportunity to donate directly to a women’s organization like Aventa, that make a difference to women’s health. Aventa was proud to participate in the Calgary Wellness Walk on Monday, November 19th to mark the start of National Addictions Awareness Week. 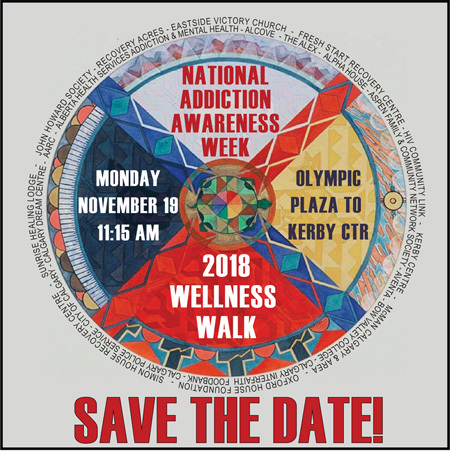 Over twenty community agencies and organizations, as well as over 200 participants marched through the downtown core to raise awareness, share hope, and promote the importance of striving to maintain community consciousness for healthy living and an addiction-free lifestyle. The walk finished at the Kerby Centre, where participants enjoyed lunch and entertainment, as well as listening to guest speakers talk about successes with recovery. National Addiction Awareness Week helps to highlight issues and solutions to help address alcohol and drug-related harm. Community agencies participate in the Wellness Walk to promote the importance of striving to maintain community consciousness for healthy living and addiction-free lifestyles. Aventa is proud to be the recipient of the Roxboro Shoppers Drug Mart Love You Campaign from September 9 – October 6, 2017. Locally-based, the annual campaign gives Shoppers Drug Mart customers and employees the opportunity to donate directly to a women’s organization like Aventa, that make a difference to women’s health. Aventa was pleased to participate once again in the Planting the Seeds of Change initiative, hosted by the Alex as part of Homeless Awareness Day on October 9, 2015. Aventa’s Clients worked very hard on this year’s entry. Once again, Aventa is fortunate to be the recipient of the Roxboro Shoppers Drug Mart Tree of Life Campaign from September 16 – October 16, 2015. Locally-based, the annual Tree of Life Campaign gives Shoppers Drug Mart customers and employees the opportunity to donate directly to organizations like Aventa, that make a difference to women’s health. As part of National Addictions Awareness Week, Save Our Kids events took place on November 17 and 18 in Calgary. On November 18, a one day forum including key stakeholders in the field of addiction and child advocacy, gathered together to dialogue, share information and explore new solultions to the fast-growing issue of prescription drug use. Save Our Kids kicked off with a city-wide youth rally on November 17, with special guest Robb Nash. The Robb Nash Project engages young people through the power of music and words, encouraging them to make positive life choices and lead lives of significance and purpose. Once again, Aventa was pleased to participate in the Planting the Seeds of Changeinitiative, hosted by the Alex as part of Homeless Awareness Day. Aventa’s artistically talented Clients designed and paint a planter box which is now up for auction with proceeds going to help end homelessness. We really appreciate the time and effort put forth by our creatively skilled Clients on this project! Aventa was selected to participate in the Horses Jump to Give a Leg Up program, hosted by Spruce Meadows. This program was created to assist those in Southern Alberta who repeatedly help others and were themselves in need of support. Aventa was very fortunate to be one of 20 no-for-profit organizations selected to design a life-sized fiberglass horse which was auctioned at the conclusion of the Masters Tournament – the winning bid on our horse was $1,100.00! Our Clients did an amazing job on this project, using their artistic skills to create Aventa’s entry, Healing Hearts through Mother Nature. Our Staff were very encouraging of the Clients’ creative process during the project and also added their own touches to the masterpiece. Once again, Aventa is fortunate to be the recipient of the Shoppers Drug Mart Tree of Life Campaign from September 17 – October 17, 2014. This year, three stores have joined forces to support Aventa including Lower Mount Royal, Roxboro and Stampede Station. Each store’s Associate-owner selects a local women’s health charity deemed especially in need of assistance and we appreciate being selected by these three stores. On October 10, 2013, Aventa participated in the Planting the Seeds of Changeinitiative, hosted by the Alex as part of Homeless Awareness Day. Aventa, along with several other agencies were asked to decorate a planter box for the silent auction. Several Clients volunteered to work on the project and spent hours designing and painting a beautiful planter box. They did a truly amazing job and in recognition of their artistic skills, they received the Judge’s Choice Award! We are very proud of their efforts and their perseverance to complete this challenging project on time. Congratulations Ladies! Aventa has been involved in many events over the past several years, which have raised both money and public profile for Aventa.